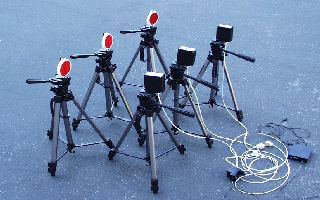 a) Repeated short-term “all-out” bouts (5 to 10 seconds) of tethered running at different velocities provide data, which can be used for the construction of individual force-velocity and power-velocity curves. Similarly to other types of muscle activity there is a decline of integrated force with increased velocity. In contrast, integrated power increases from lower velocities, reaches a maximum, and then, toward to higher velocities, declines again. Maximal drag power and corresponding velocity can be derived from such a curve. 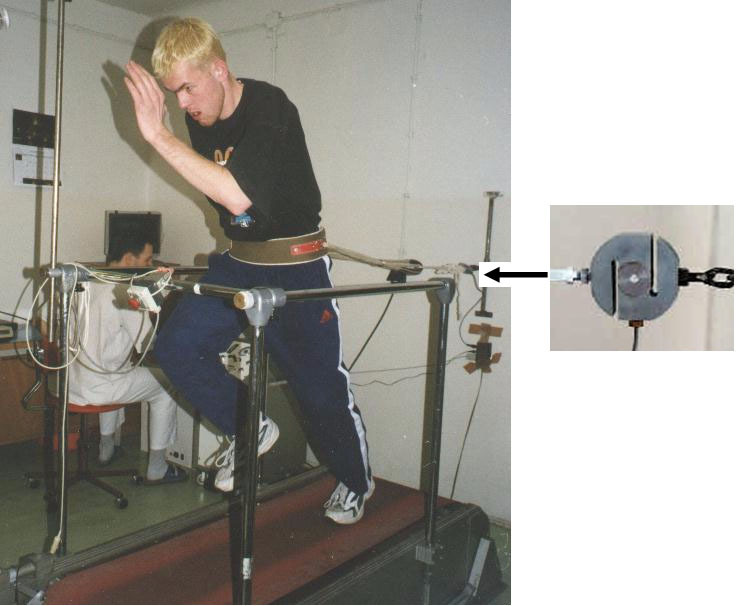 b) During the 30-second „all-out“ tethered running on the treadmillsubjects, in addition to running, have to pull a rope attach by means of the belt to the waist and anchor to the wall behind device. 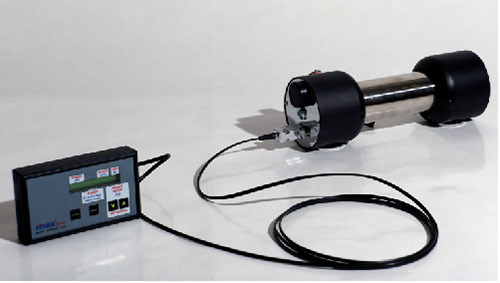 A simple computer based system consisting of strain gauge, tensometer, tachodynamo, and AD convertor is employed to register the horizontal drag force, running velocity and to calculate power produced. From raw data sampled at 100 Hz, 5-second interval values are calculated to plot the power/time charts. Test-retest correlation coefficients have been found to be r = 0.845 for maximal power, r = 0.916 for mean power, and r = 0.879 for fatigue index. These values were better at lower (8 km/h) r = 0.926 than at higher (18 km/h) velocities r = 0.848. Analysis of repeated measures revealed a measurement error from 5.4 to 8.7 %, which is in the range comparable to common motor tests. This indicates that such a method may be applied in sport practice. 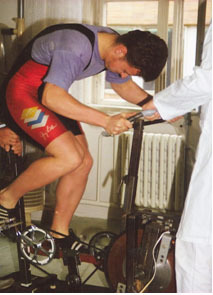 An „all-out“ load on the cycle ergometer, either in a revolution dependent or an isokinetic mode, represents a typical form of exercise used for the laboratory assessment of anaerobic capabilities. On the other hand, for many sports pedalling does not provide a specific form of muscle activity. For most of the weight bearing activities running seems to be more appropriate alternative. 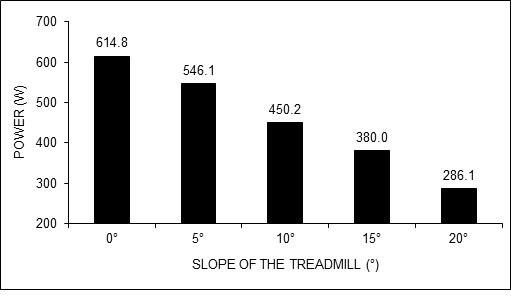 However, with simple treadmill running it is practically not possible to implement a time limited „all-out“ task. This drawback can be avoided by modified activity termed as a tethered running, during which performing subject in addition to running, pulls a rope attached to the waist belt and the wall behind the treadmill. A simple computer based system can be employed to register the drag force, running velocity and to calculate drag power produced. Data collected reveal the stride dependent fluctuation of force and power over time and enable calculation of peak as well as average values of force and power for specific period. Analysis of power during short-term isokinetic cycling and tethered running showed that sprinters performed significantly better on the treadmill than on the cycle ergometer. Contrary to this, cyclists achieved higher “all-out” power during cycling than during tethered running. Therefore, in some sports tethered running on the treadmill may be considered as a more specific and hence more suitable alternative for the assessment of anaerobic capabilities. 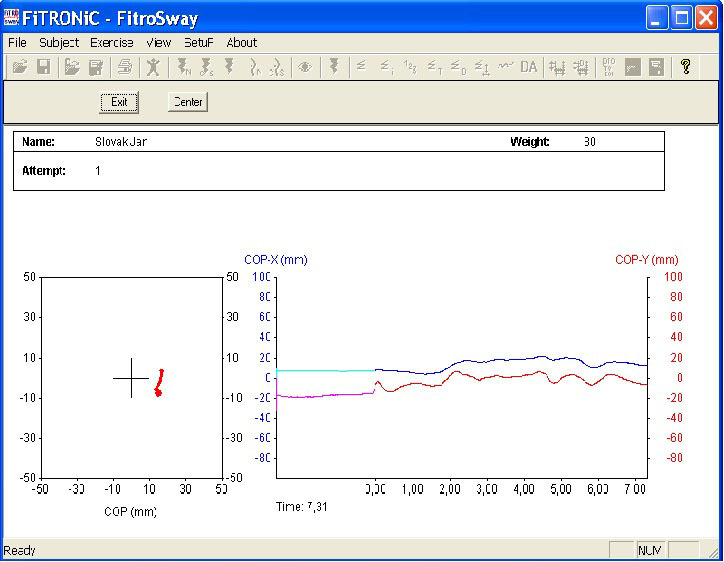 A close relationship between the parameters of anaerobic capabilities achieved in 30-second „all-out“ tethered running on the treadmill at velocity of 13 km/h and cycling on the isokinetic ergometer at revolution rate of 100 rpm has been found (max power r = 0.877, mean power r = 0.920, fatigue index r = 0.896). The tethered running and isokinetic cycling did not differ significantly neither in maximal power nor in mean power. 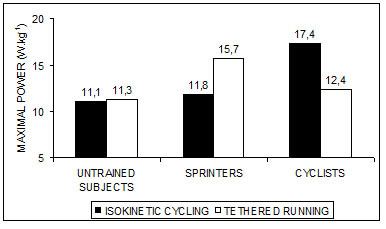 However, the fatigue index and blood lactate were significantly higher in tethered running than in isokinetic cycling. Taking in account no significant differences in maximal and mean power production between both exercise modes examined it may be concluded that 30-second „all-out“ tethered running on the treadmill represents an acceptable alternative for the assessment of anaerobic capabilities. However, in comparison with isokinetic cycling slightly higher values of fatigue index and blood lactate have to be expected. It has been found no significant difference in the initial 5-seconds period in maximal drag power produced at 10 km/h and 18 km/h. 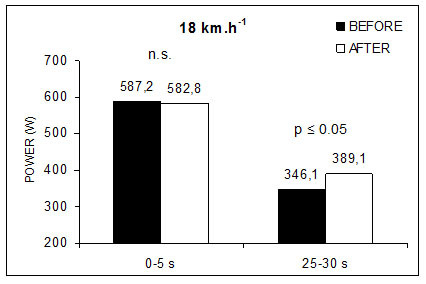 However, in the final period a power produced at 18 km/h was significantly lower than at 10 km/h. 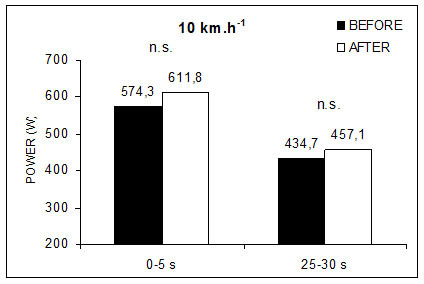 Consequently, fatigue index calculated from the entire 30-second test was significantly higher at 18 km/h than at 10 km/h. This is very probably due to more pronounced activation of fatigue prone fast twitch fibers during running at higher velocity. It was concluded that fatigue in the final period of 30-second “all-out” exercise impairs the ability to produce drag power more profoundly at higher than at lower velocities. It has been found that wrestlers and karate athletes achieved significantly higher maximal drag power than physical education students. In addition, there were no differences in its values in the initial 5-seconds period of exercise in both groups of athletes. However, wrestlers were not able to produce maximal drag power during entire 30-second period of the task as showed by significantly higher fatigue index than in karate athletes. Using this method, a significant difference in drag power produced at higher (18 km/h) but not at lower velocities (10 km/h) has been found after 4-weeks of karate training. In contrast, following the same period of training in karate athletes there were no changes in power output evaluated by 30-second „all-out“ load on the isokinetic cycle ergometer. These differences may be ascribed to the specific adaptation due to preferred exercise mode used for anaerobic training. Therefore, in order to obtain relevant information concerning anaerobic capabilities, the exercise close to one used during training should be preferred, such as jumping, cycling, stair uphill running, paddling, rowing, tethered swimming, tethered running, etc. 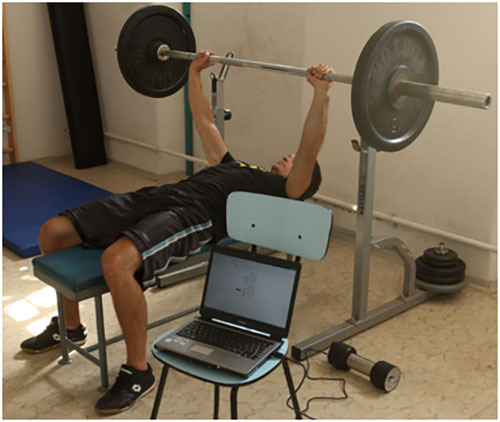 Contrary to untrained population, in which one of the standard tests can be applied, in athletes it should be the exercise forms involving the same or similar muscle group and movement patterns as during sport specific tasks. Dzurenková D, Zemková E, Hamar D, Marček T, Hájková M, Dvorský B (1998). Izokinetická bicyklová ergometria v diagnostike silových schopností dolných končatín karatistov. Súhrny prednášok z XXXVII. východoslovenských lekárskych dní. Nový Smokovec: Slovenská spoločnosť telovýchovného lekárstva, 11. Dzurenková D, Zemková E, Hamar D, Marček T, Hájková M, Dvorský B (1998). Skúsenosti s využitím izokinetického bicyklového ergometra pri posudzovaní silových schopností karatistov. Súhrny príspevkov z Národného kongresu telovýchovného lekárstva. Tále: Slovenská spoločnosť telovýchovného lekárstva, 16-7. Dzurenková D, Zemková E, Hamar D, Marček T, Hájková M, Dvorský B (1999). Izokinetická bicyklová ergometria v diagnostike silových schopností dolných končatín karatistov. Slovenský lekár, 9 (4-5), 145. Dzurenková D, Zemková E (1999). Izokinetická bicyklová ergometria v diagnostike silových schopností karatistov. Česká kinantropologie, 3(1), 45-55. Dzurenková D, Zemková E, Longa J (2000). Zmeny parametrov anaeróbnych alaktátových a laktátových schopností po 6-týždňovej príprave u karatistov. Zborník z vedeckého seminára “Využitie pohybových štruktúr úpolov v iných pohybových aktivitách”. Bratislava: Fakulta telesnej výchovy a športu UK, 97-103. Dzurenková D, Zemková E, Marček T (2002). Diagnostika silových schopností v laboratórnych podmienkach. Medicina Sportiva Bohemica et Slovaca, 11(3), 200. Hamar D, Zemková E (2000). Závesný beh na bežiacom koberci ako alternatívny spôsob posudzovania anaeróbnych schopností. Abstrakty z Národného kongresu telovýchovného lekárstva “Telovýchovné lekárstvo na prahu tretieho tisícročia”. Dunajská Streda: Slovenská spoločnosť telovýchovného lekárstva, 12-3. Zemková E, Dzurenková D, Hamar D (1998). Zmeny silových schopností dolných končatín v priebehu dlhodobej a krátkodobej športovej prípravy reprezentantov karate. Zborník zo 6. medzinárodnej vedeckej konferencie CO-MAT-TECH. Trnava: Materiálovotechnologická fakulta STU, 698-701. Zemková E, Schickhofer P, Dzurenková D (1998). Efekt tréningu v hokeji a v karate na parametre anaeróbnych schopností. Zborník z celoštátnej vedeckej študentskej konferencie doktorandov s medzinárodnou účasťou. Bratislava: Fakulta telesnej výchovy a športu UK, 20-4. Zemková E, Hamar D (1999). Reliabilita stanovenia ťahového výkonu pri závesnom behu na bežiacom koberci. Zborník zo 7. medzinárodnej vedeckej konferencie CO-MAT-TECH ´99. Trnava: Materiálovotechnologická fakulta STU, 657-61. Zemková E, Hamar D, Schickhofer P (1999). Vplyv športovej prípravy v karate na maximálny ťahový výkon pri závesnom behu rozdielnou rýchlosťou. Zborník z medzinárodnej konferencie “Telesná výchova, šport, výskum na prelome tisícročia”. Bratislava: Strojnícka fakulta STU, 146-50. Zemková E, Hamar D, Schickhofer P (1999). Vplyv únavy na maximálny ťahový výkon pri behu rozdielnou rýchlosťou. Zborník z medzinárodnej konferencie „Pohyb a zdraví“. Olomouc: Fakulta tělesné kultury UP, 568-71. Zemková E, Hamar D, Schickhofer P (2000). Parametre anaeróbnych schopností pri závesnom behu na bežiacom koberci a práci na izokinetickom bicyklovom ergometri. Tel Vých Šport, 10(1), 16-8. Zemková E, Dzurenková D (2001). 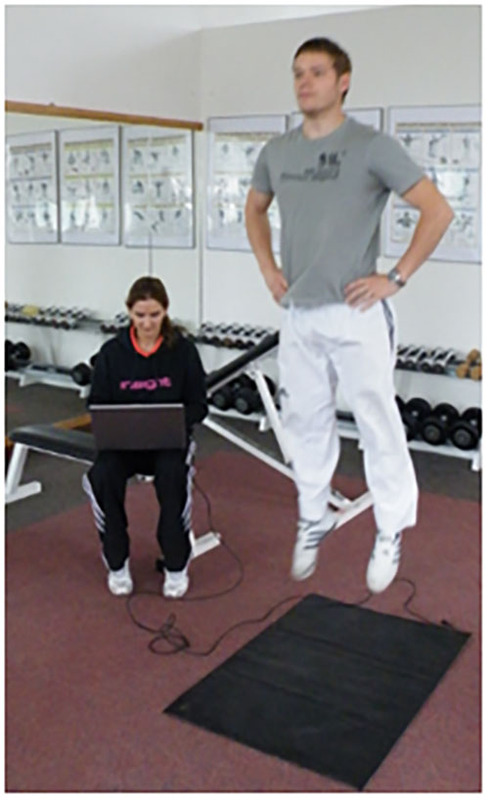 Isokinetic cycle ergometer in functional diagnostics of karate athletes. Homeostasis, 41(6), 262-4. Zemková E (2002). Parametre anaeróbnych schopností po 4-týždňovom mezocykle u karatistov posudzované „all-out“ zaťažením na bicyklovom ergometri a bežiacom koberci. Acta Universitatis Matthiae Belii „Telesná výchova a šport“, 4(4), 100-3. Zemková E. Hamar D (2002). Závesný beh na bežiacom koberci v diagnostike anaeróbnych schopností. Bratislava: PEEM, ISBN 80-88901-69-3, 32. Zemková E, Hamar D (2002). 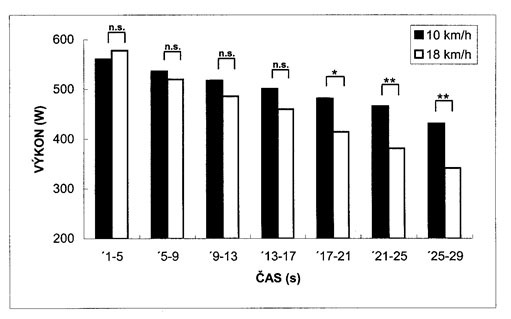 Parameters of anaerobic capabilities in 30-second “all-out” tests of isokinetic cycling and tethered running. Medicina Sportiva, 6(1), 69. Zemková E, Dzurenková D (2003). Posudzovanie silových schopností karatistov pomocou izokinetickej bicykovej ergometrie. Zborník zo seminára s medzinárodnou účasťou „Súčasný stav a perspektívne tendencie v telovýchovnom procese a vo voľnom čase žiakov na základných školách“. Banská Bystrica: Univerzita Mateja Bela, Pedagogická fakulta, 146-9. Zemková E, Hamar D (2003). Závesný beh na bežiacom koberci vo funkčnej diagnostike športovcov. Medicina Sportiva Bohemica et Slovaca, 12(2), 61-8. Zemková E, Hamar D (2004). 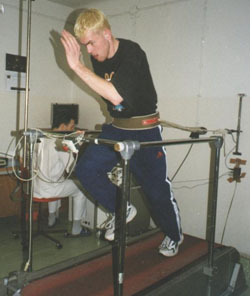 „All-out“ tethered running as an alternative of Wingate anaerobic test. Kinesiology, 36(2), 165-70. Zemková E, Hamar D (2006). Diagnostika vybraných pohybových schopností. Bratislava: PEEM, ISBN 80-89197-55-8, 116. In case of interest contact us by email or contact form.